The whole class with Mr. Billy Hix getting ready for the drop. East Side’s 4th graders enjoyed an educational and fun-filled Friday on September 3. John Van Hooser, who had an exciting 38-year career with NASA, visited the class. John shared several stories about his work in the Apollo program and his role as a lead engineer in the Shuttle Design Team. His insight about the Apollo program helped the students really think about how to design a successful Moon Lander. After Mr. Van Hooser’s lesson, the students got into teams and began designing their own “Moon Lander” out of various materials. Styrofoam bowls/cups, cotton balls, bubble wrap, newspaper, balloons, and masking tape were the materials available to purchase with their Moon Lander budget of $25,000. The team who designed the most inexpensive lander that landed their “astronaut” safely would be the winner of the contest (the “astronauts” were actually eggs). Each team’s lander was unique and included a different approach in design. 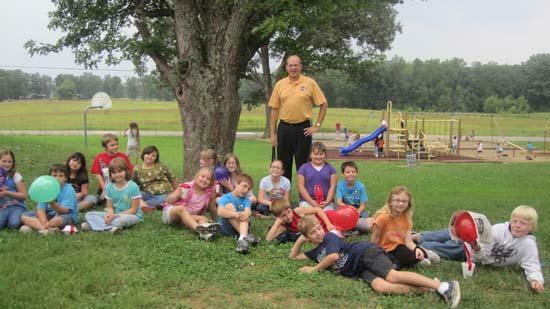 Mr. Billy Hix, a Professor of Education at Motlow College, later visited the class to see the actual dropping of the Moon Landers. Mr. Hix has worked many years as a Faculty Fellow for NASA at Marshall Space Flight Center. His lesson about astronauts was amazing. The students had many questions including some rather funny ones about how astronauts eat in space and how they go to the bathroom in space. The big moment arrived, and Mr. Trigger Blanton, our custodian, climbed to the roof of the school and launched our Moon Landers onto the playground where the 4th graders were eagerly waiting. Most designs landed the astronauts safely; however, one team’s lander was really outstanding. The winning team members were: Alex Clark, Marcus Gannon, and Emily Morgan. They only spent $5,250.00 on their lander, and their egg/astronaut survived the impact! All the students did a wonderful job! A special thanks goes to John Van Hooser and Billy Hix for taking time to visit our classroom. Also, thank you to Trigger Blanton for climbing on the roof for us! It was an unforgettable day!